Regatta Songs and Stories (2004). Greg Denieffe continues his busk from Newcastle to Newfoundland and finds himself in a strangely familiar place. I recently purchased a CD of rowing songs from Canada to add to my one from the North East of England; two CDs make a Crewcial Collection, right? Part I concluded with the death of James Renforth in Saint John, New Brunswick. This second part is about a similarly named place, St. John’s, Newfoundland, which on a global map looks a hop-step-and-a-jump from Saint John but is actually about 1,000 kilometres away as the crow flies. It has been a part of Newfoundland history for almost 200 years. The first record of an organized event was in 1816, but rowing matches were common among ships crews in St. John’s Harbour since at least the 1700s. These days, the Regatta draws crowds of up to 50,000 people annually to the shores of Quidi Vidi Lake. It is widely known as “The Largest Garden Party in the World” because it has been about socializing as much as amateur sport. Concession stands, wheels of fortune, games of chance, and food & drink are just as much part of the Regatta’s history as the races. The collection of songs on this CD, Regatta Songs and Stories, covers all aspects what makes Royal St. John’s Regatta a very unique event: the anticipation of the coming races, the records set, the legends both on and off the water and the family atmosphere surrounding the whole day. What surprised me most about this collection was the familiarity of the music; of the tunes and the lyrics, not to mention the instruments and the accents but above all – the names mentioned in many of the songs – it was like a roll call in an Irish classroom. Let me take you through the tracks with a verse from each (as heard by me, as no lyrics supplied). Track 1 – Up the Pond (Francis Forbes). There is a little flavour of the tune in this video. No lyrics to this tune but it has quite a history. It was written in 1820 by Sir Francis Forbes, Chief Justice of Newfoundland, during a time when his ship was lost in fog on the Grand Banks. Also known as The Banks of Newfoundland, as a Regatta tune, it is more popularly known as Up The Pond and is traditionally played as the crews pass the bandstand on their return to the stakes on the second leg of a race. Track 2 – On Regatta Day (Ray O’Leary). A modern song written and performed by Ray O’Leary who also plays guitar, bass and bodhran. So, take me down to St. John’s town on regatta day. and watch the crews row on the pond as the crowds all gather there. When I set foot down by the lake you know my heart is there. Track 3 – 9:12.04 (Pat Casey with additional; lyrics by Ray O’Leary). The race that gave us track 3. If you listen, a story I’ll tell you. By a great crew of Outer Cove sons. They rowed it in 9:13. He assembled a crew that could win. Track 4 – One Last Spin (J. Morrissey). This is a story of what happens when you let your heart rule your head. Here are the opening lines followed by a snippet from the chorus. 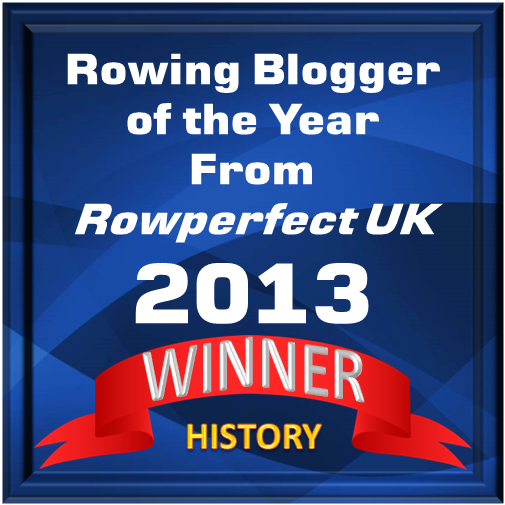 I rowed on the pond for 37 years. And drank too many beers. One day I met an old friend whilst sitting in the sun. He said let’s put a crew together – for a bit of fun. We’re the only crew that has more than one stroke. They can’t use a starting gun cos we may croak. Track 5 – Star of the Sea (Traditional). Not an official Flag of Newfoundland but often looked upon as one. Originating in the 1880s as the flag of the Catholic fraternal group, the Star of the Sea Association, it bears a strong resemblance to the nearly identical Flag of Ireland but with the orange panel removed and replaced by a pink panel. A short song about a boat on its Christening Day. Once blessed, the Outer Cove boys take her for a spin on the lake. Headed by the Star Flag, the old Pink, White and Green. Sir Michael Cashin gave her, and they gave three cheers for him. They are all so proud of the president, his son. Father Daniel Callaghan who loved his sons of toil. Track 6 – It’s Regatta Day Today/Turning the Buoys (Ray O’Leary/Ray O’Leary and Pat Moran). A short song followed by a rousing tune; all together it lasts three minutes. The weather is key to Royal St. John’s Regatta, traditionally held on the first Wednesday of August; if weather and wind conditions are not suitable, the event is postponed until the next suitable day. Since Regatta Day is a civic holiday in St. John’s, this means that the weather actually determines whether or not workers have the day off. Track 7 – Ladies of the Lake (J. Morrissey). Ladies of the Lake celebrates the first time that women raced at St. John’s Regatta. In 1856, two women’s crews from different neighbourhoods of St. John’s, one from Quidi Vidi and one from The Battery, raced in traditional six-oar boats with the Quidi Vidi women taking the win. It was almost another century before women again competed at the regatta. A 1945 newspaper column ‘Notes on the Regatta’ reported the decision of the Regatta Committee not to include a Ladies’ Race in the WW2 Victory Regatta but this was overturned in 1949 – and four-women’s crews competed in that year’s event. Here’s to all you women who take up the oar. Like the daring young ladies in days of yore. To you all, we’ll raise a glass of cheer. You do us proud year after year. When Quidi Vidi and The Battery raced end to end. And claimed their rightful place for evermore. 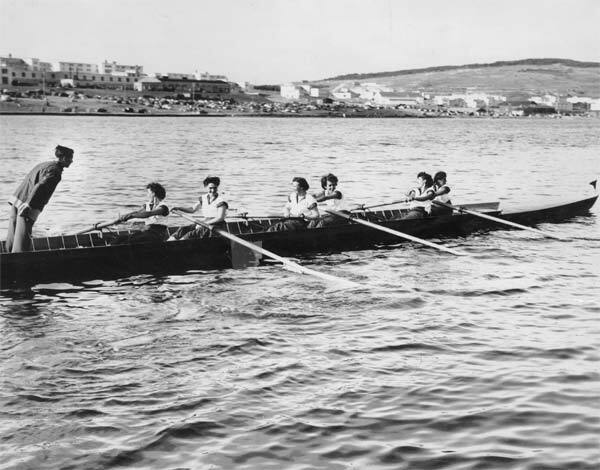 Bowring’s Ladies, winners at the 1949 St. John’s Regatta. Photo: The Rooms Provincial Archives. Track 8 – Me and My Dad (J. Morrissey). 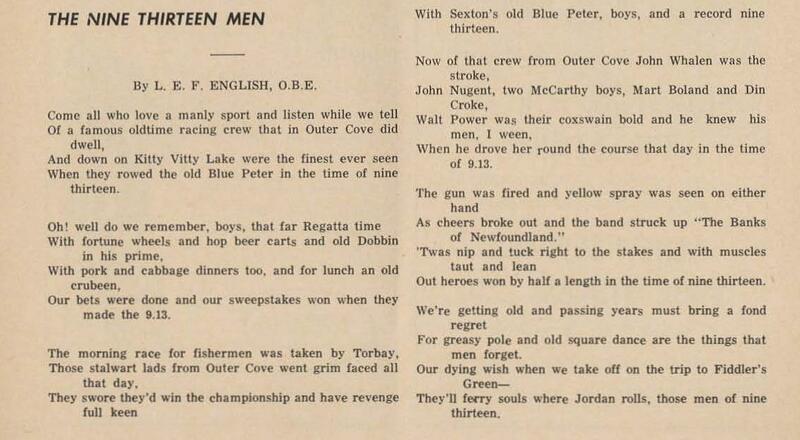 Two verses from either end of this song reveal the traditional family day out that has sustained St. John’s Regatta for two centuries. I’m not crying, you’re crying! He took me to the races; we sat up by the band. There were crowds where’er I looked. To watch the races and play the games, me and my son. Track 9 – Coppertop (Jack Dodd). Bob ‘Copper Top’ Codner was the stroke of the Torbay crew that won both the Fisherman’s Race (time 9:31.6) and the All Comers Race (time 9:29.0) in 1934. I’m not sure how his nick-name should be written – as in the title of the song or as in an article called “Police got a break from Torbay, “Copper Top”” from The Telegram (St. John’s) printed on 31 July 2012. His friends they called him Copper Top but Codnor was his name. And down on Quidi Vidi Lake, he rowed his name in fame. For out of races is twenty-nine, twenty-eight he won. For years the second fastest time on Quidi Vidi pond. Track 10 – The legend of William Summers (Gus Burton). This song celebrates the achievements of the William Summers sponsored crew that won six championships in-a-row between 1959 and 1964. They became known as The Untouchable Crew and were usually chased down the course by a crew of policemen, so perhaps a misquote from Bob Dylan’s She Belongs to Me – “the Law can’t touch ‘them’ at all” – is appropriate. Concerning the boys of the William Summers Crew. They rowed on the pond in the Championship race. They hold the record of six victories straight. Track 11 – 9:13 (Mary Stack). Image from ‘Newfoundland Quarterly’, Volume LIII, Number 2A, August 1954. Track 12 – An Oarsman’s Dream (J. Morrissey). This is the longest track at 6:50 and it is a spoken poem or prose poem set to the gentle sound a guitar. Last evening, I went for a walk down around the lake. Halfway round I sat down on a grassy hill for a break. I put my head back and looked up at the clear blue summer Skies. After a long moment or two, I gradually shut my eyes. The story continues and sees the narrator approached by a stranger and taken for a spin in a boat. They clock eight-minutes over the championship course (not one of their fastest times!). Well it is a dream … or is it? 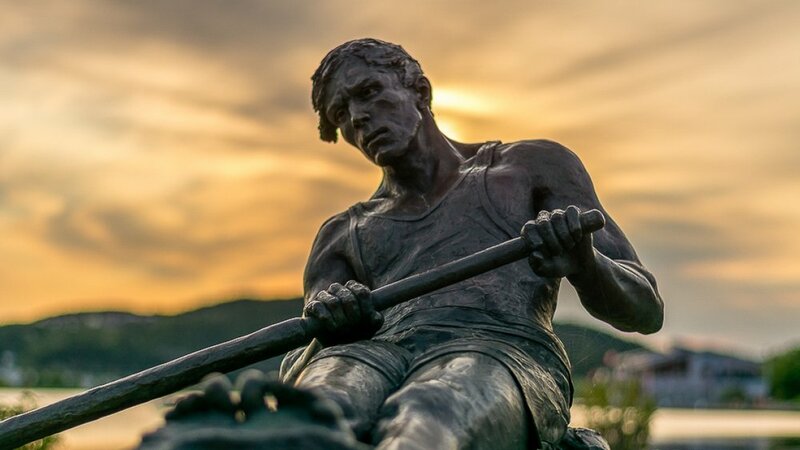 If he had continued his walk around the lake, he would have come across a beautiful sculpture installed in 2005 to celebrate the regatta. Read more about ‘The Rower’ on sculptor Morgan MacDonald’s website. The Rower at Quidi Vidi Lake, St. John’s, Newfoundland. Picture: Morgan MacDonald. This CD is well worth a listen. My only reservations are the order of the tracks and I would like it to have had a stronger finish, perhaps with a reprise of Up the Pond. Something like this by Newfoundland trad-music outfit Shanneyganock. Are you ready? Next Looking Forward To The Boat Race?